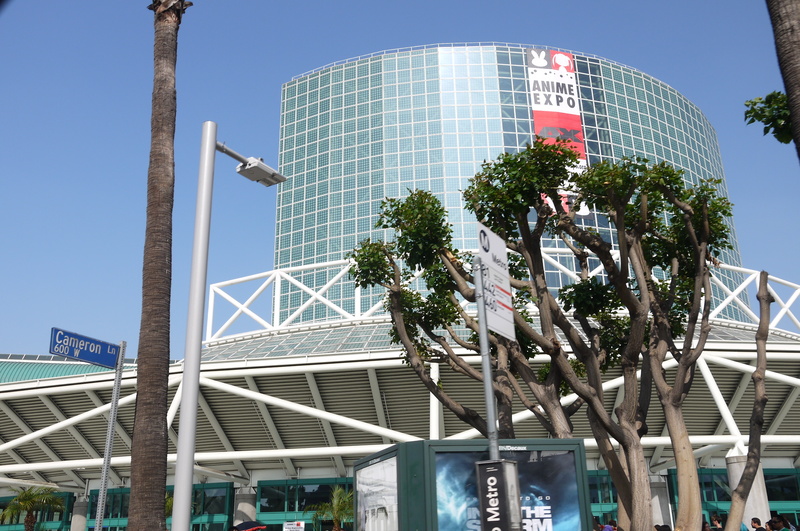 The big day finally came, and through all the cosplay preparations, I didn’t get as much sleep as I would have liked before a big convention like this. 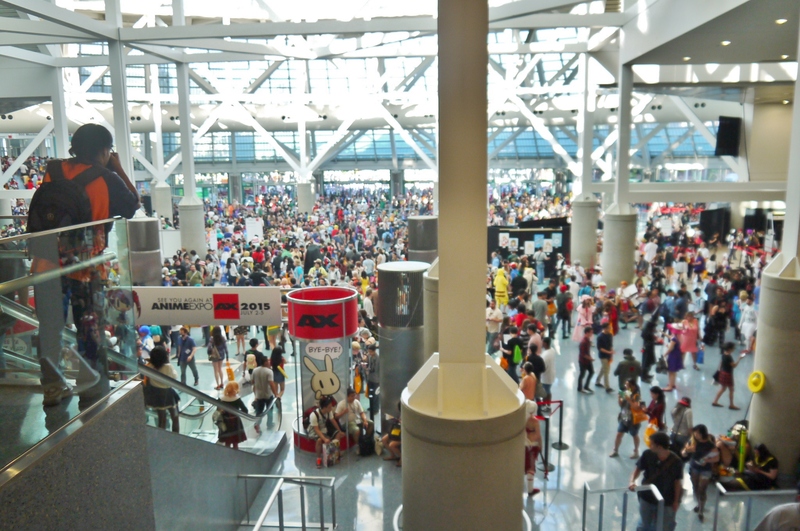 Either way, another year at AX means another series of jaw-dropping cosplay and seas of anime to gawk at. 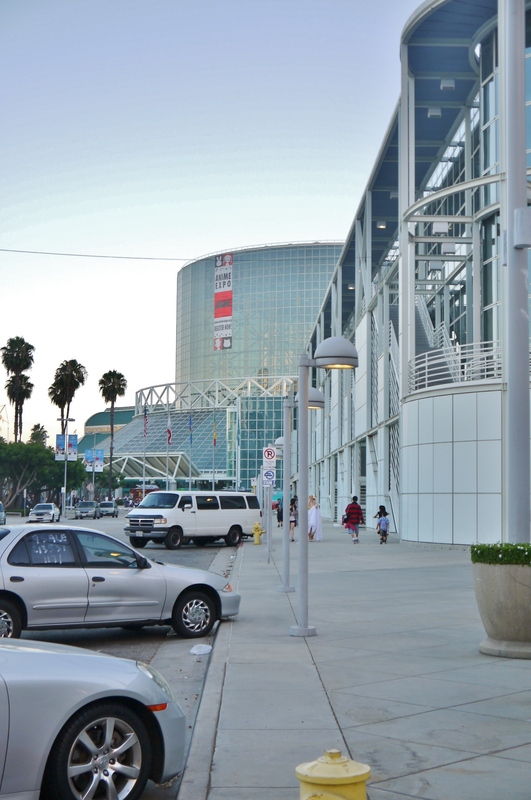 Once again, we’re hitting the LA Convention Center relatively early in the morning to beat the line for badges…or so we thought. Despite coming an hour or two earlier than usual, we still ended up stuck outside in the California heat. 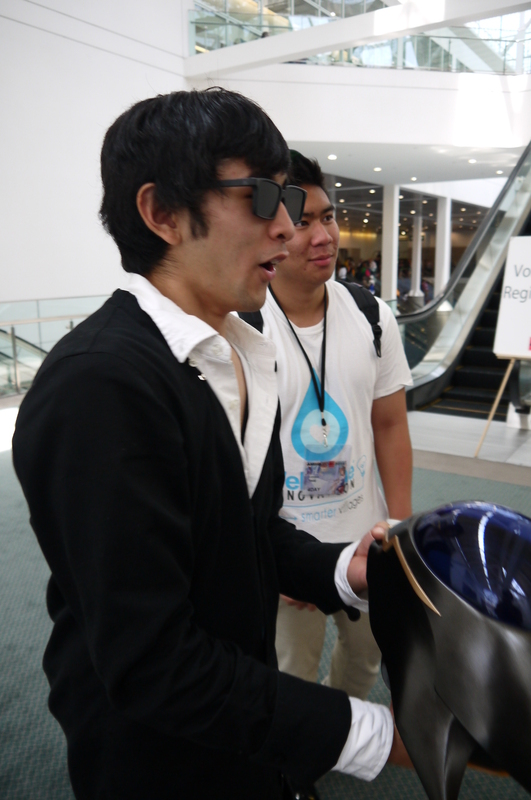 The line was pretty insane – moreso than I remember from previous years. It also seemed hotter than usual, but maybe that was my costume speaking. Before we actually got in line, my comrades and I had to find our other colleagues to drop off Operation: NT-D with. We weren’t about to haul the giant trash bags with the armor inside with us through the line. 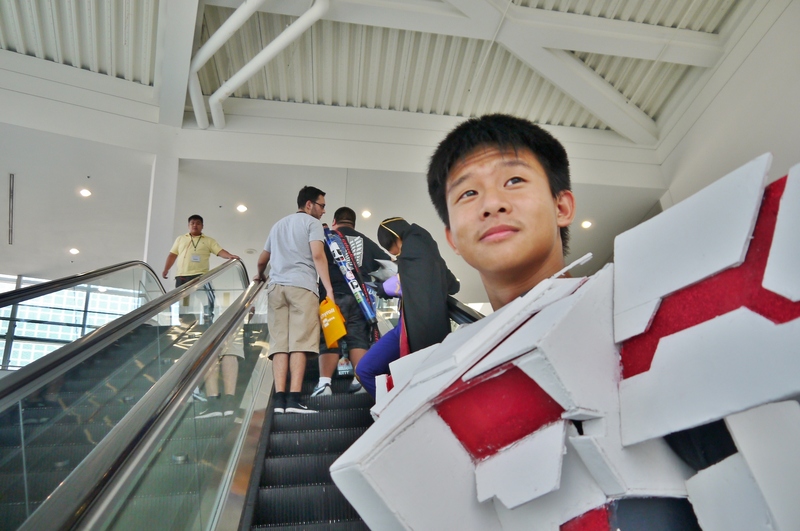 By the time we got back after we dropped off the armor, the line had gotten even longer. 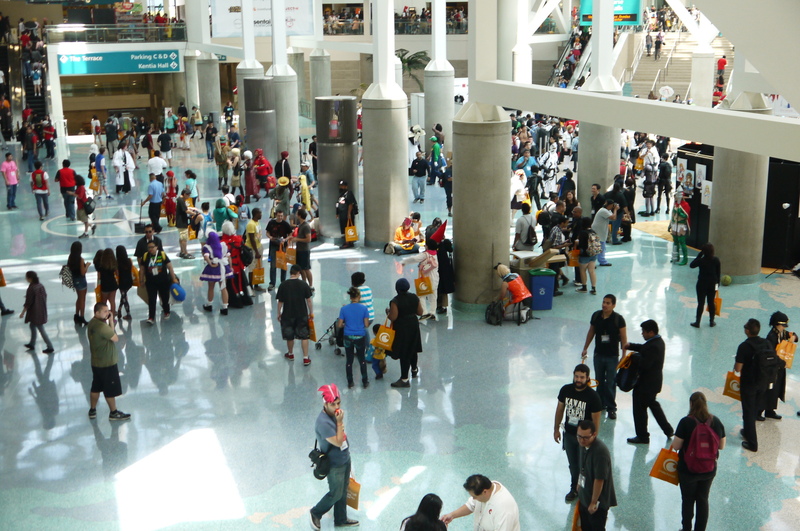 That sore irony when we finally get inside though, and we couldn’t pick up our badges because we didn’t have any official age identification and one of our party was under 17. Thankfully my comrade had the genius idea of proving our age by pulling up our student demographics online, which ended up working, but we were pretty surprised that they actually asked for age identification this year. It had never happened to us before, but it looks like it’s just the luck of the draw with which personnel is dealing out your badges. Met up with our other comrades. 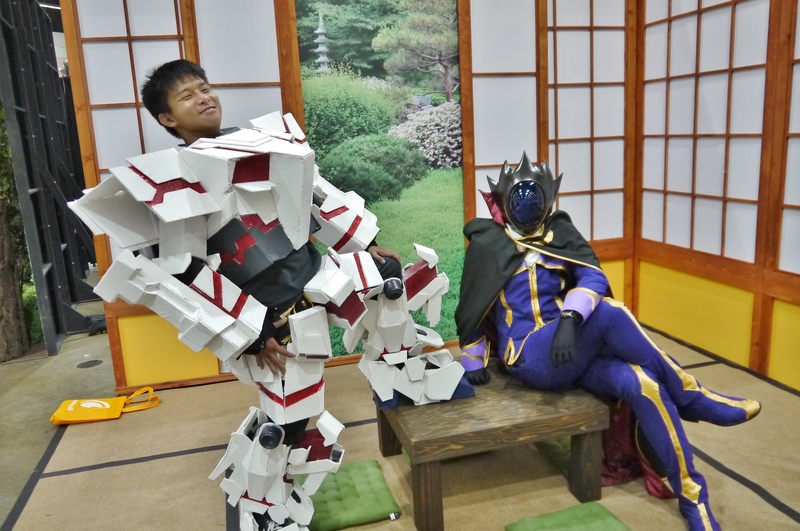 I came with the same two guys as last year, my photographer and my partner who’s wearing the NT-D armor. With these other guys added to our party, we have a total group size of about seven of us. A bad example of it, but in reality there seemed to be more people here today than ever before. 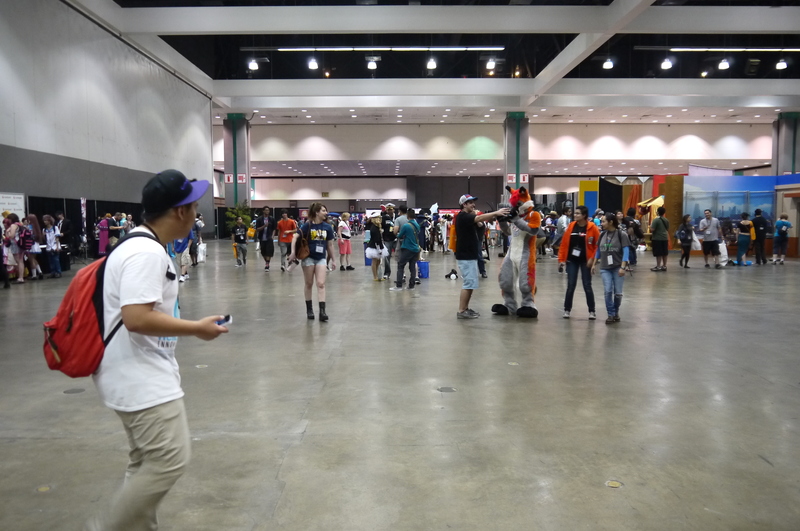 I have literally never seen a larger crowd of people all clustered in one building, it was pretty surreal. First order of business upon finally getting inside to the air conditioned bliss of the convention lobby was to get my partner suited up. Everything went pretty much as planned for this round, but I’m having some doubts about the foam’s integrity already. Most of the parts held up through the bag ride, but one or two pieces popped off. 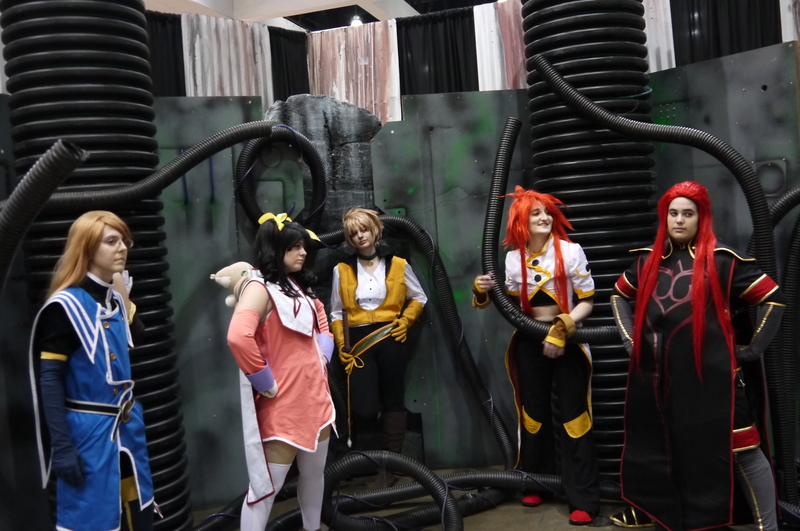 Thankfully there was this really cool feature this year at AX – the cosplay hospitality center, or cosplay repair center. 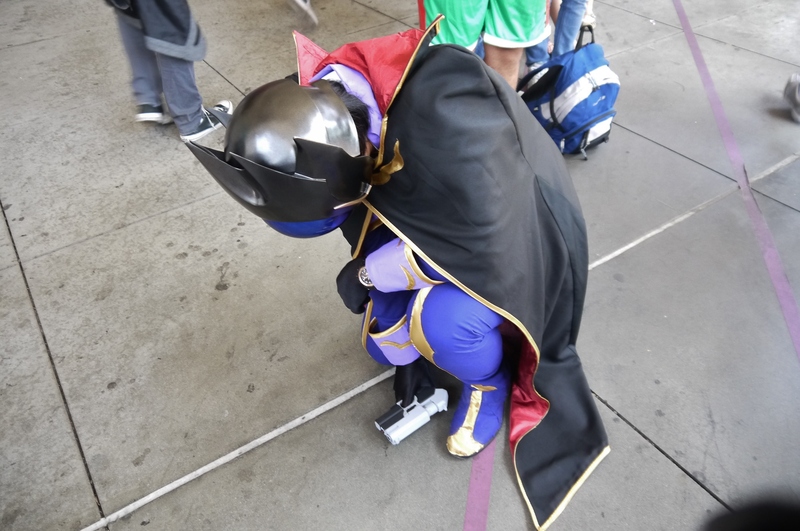 They supplied cosplay materials (glue guns, duct tape, exacto knives, you name it) at no cost, just had to turn your badge in to the table when you checked something out. Best part was, that area was like the coolest and most heavily air conditioned place at the Expo, making for an ideal place to rest our tired feet and sweaty bodies. After repairs, there he is. My cameramen lent him his appropriately colored sunglasses in place of the helmet we lacked. What a badass. I’m glad what we had at least worked fairly well. It’s gonna take my colleague some time to get used to clomping around the Expo, so we had to move out at a pretty slow pace. 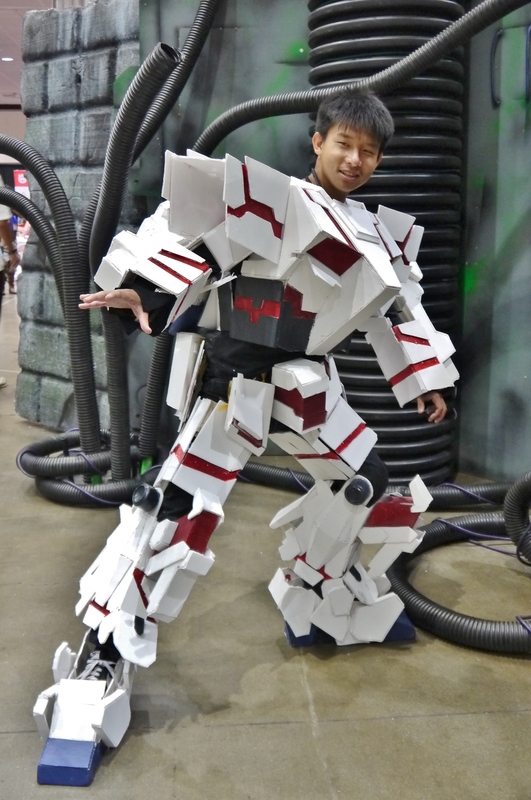 My other buddy with his completed cross-gun-thing and Trigun outfit. Swaggy. 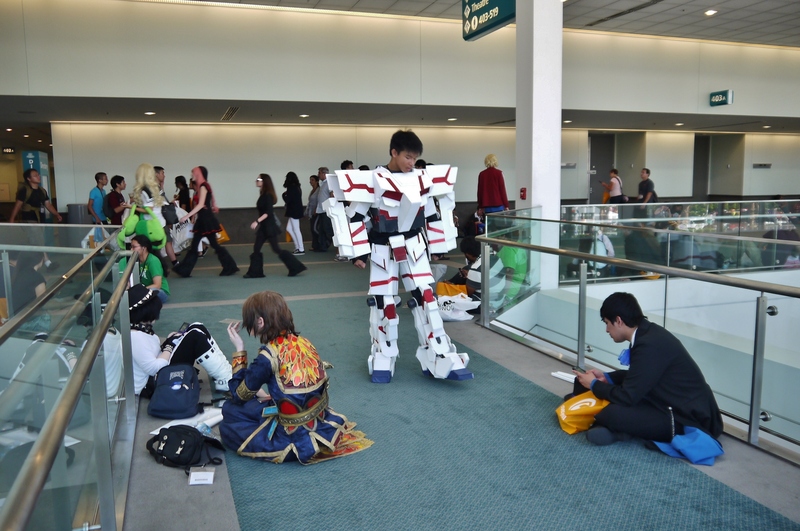 So before we hit the Entertainment Hall, how about some cosplay? 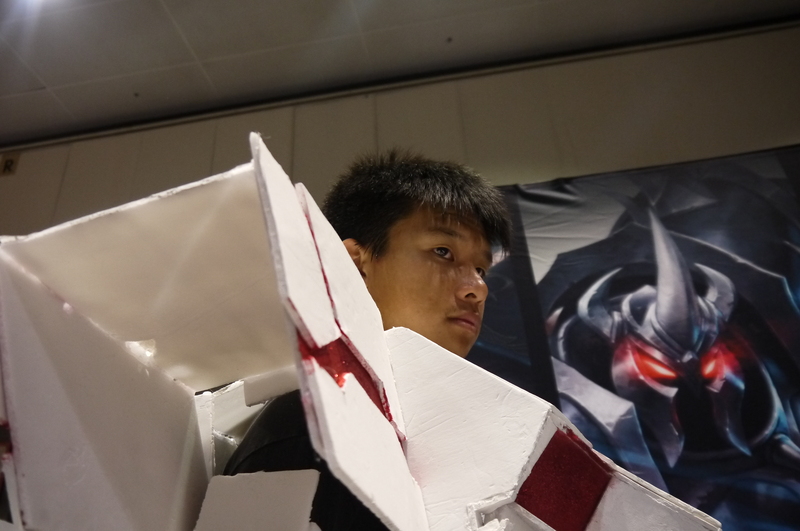 So far I’ve seen a lot of talented cosplayers; this year’s yielded a good batch. 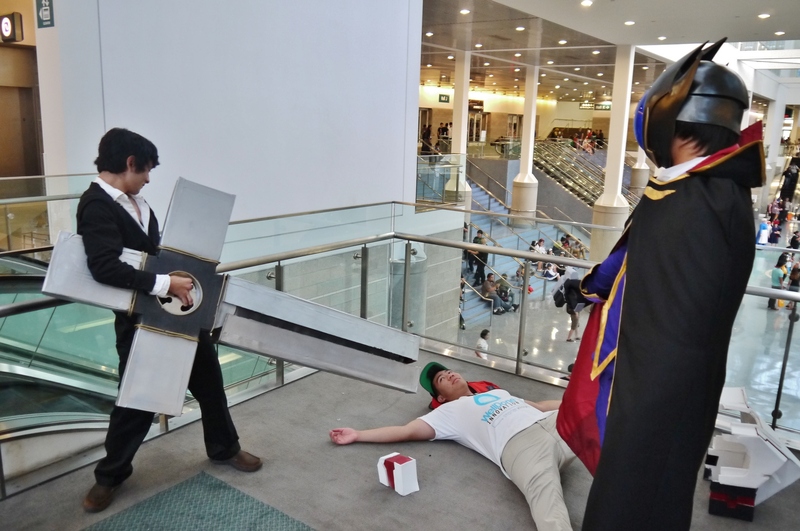 That guy who was the Death Note and let people sign on him – genius. 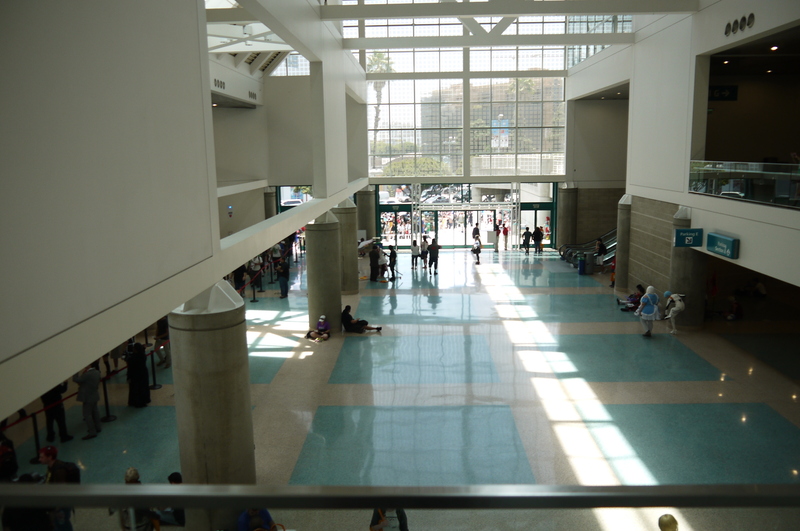 So I don’t believe we’ve ever actually checked this place out properly before at AX – in the West Hall is a big area called the Entertainment Hall, which houses most of the competitive and free gaming stations. There are rows upon rows of televisions with Wiis, XBoxes, Playstations, and even stand-up arcades. I was almost tempted to join in a game of Brawl. 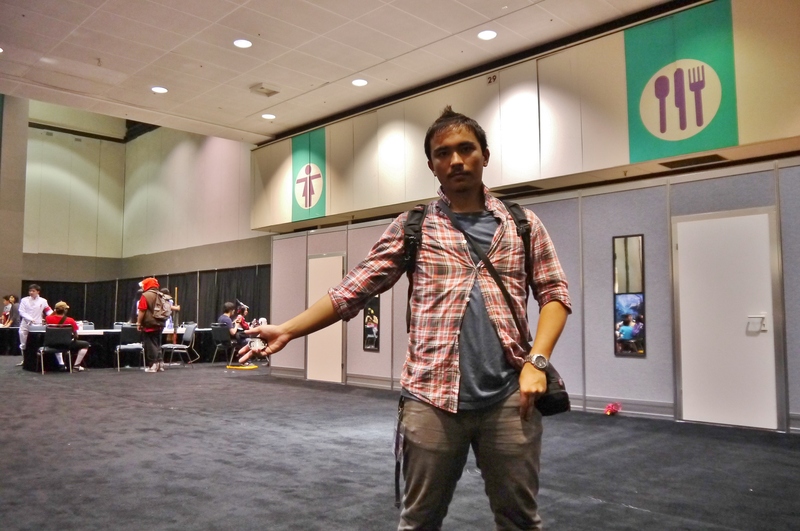 What I didn’t know also existed in this hall was a whole mess of photo backdrops for cosplayers. Like they had a pretty varied and detailed prop setup going on here, with sci-fi, Arabian, gothic, school rooftop, bedroom, you name it. 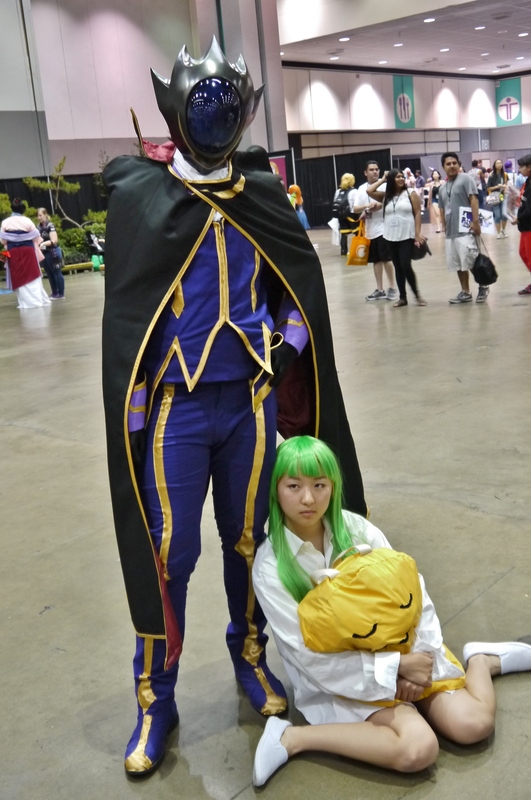 Needless to say my fellow cosplaying partner and I had to have some fun. I can’t believe I never discovered this place before. He tried going for that sci-fi feel, but I’m pretty sure that backdrop is worlds away from any Gundam setting. He’d look more normal in a pink teacup room. Met my first C.C. of the day. That Cheese-kun doe, I do want. A shot of my camera-man. Always behind the camera so we’ve never seen his mysterious face until now. He made a Batman and Bane play rock paper scissors. Why? I can only guess what inspired him. 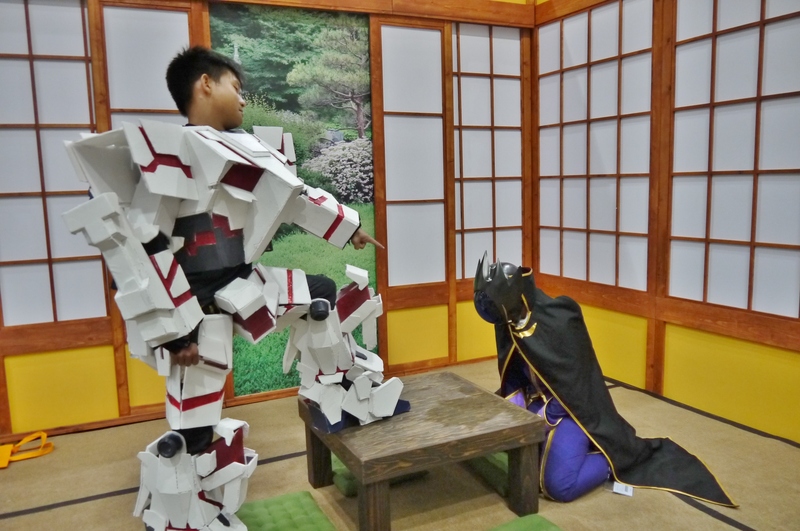 While at the Entertainment Hall we stopped again to make some more repairs to my buddy’s armor. It seems to be coming apart a little more by the hour, but thankfully the repair center is there. 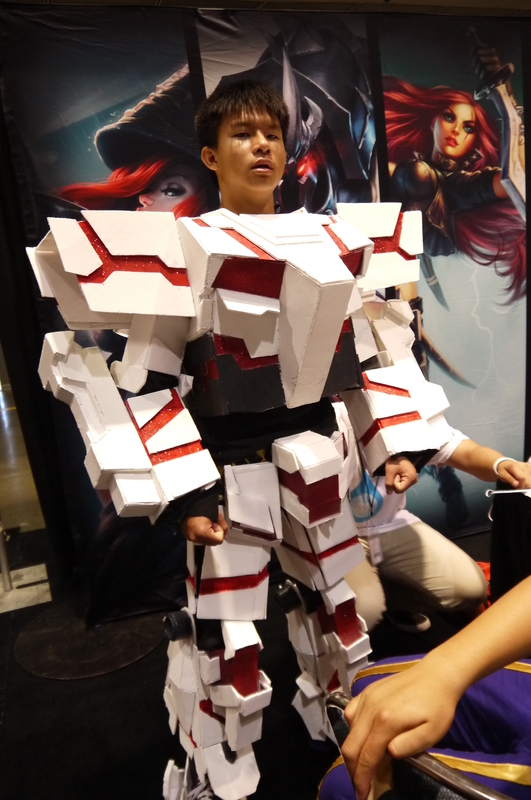 This guy gets some special mention – I don’t even know what that armor’s from, but it looks downright badass. 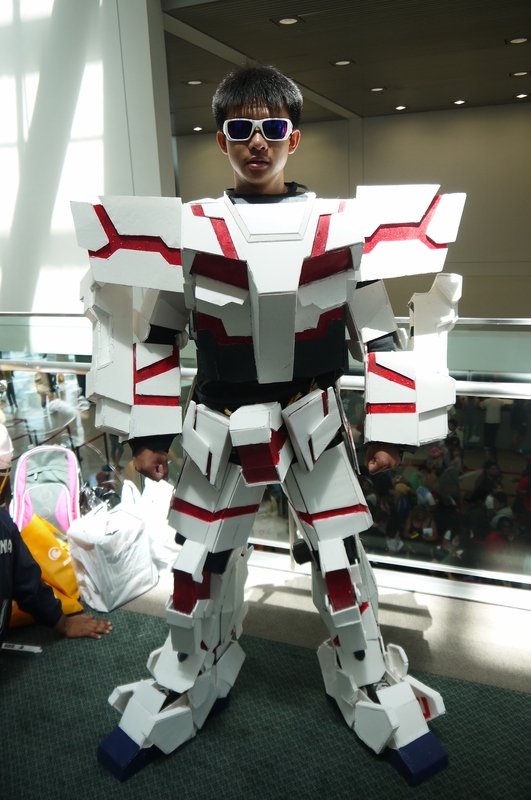 The faceplate and the gold emblem on his chest takes the cake, much props. 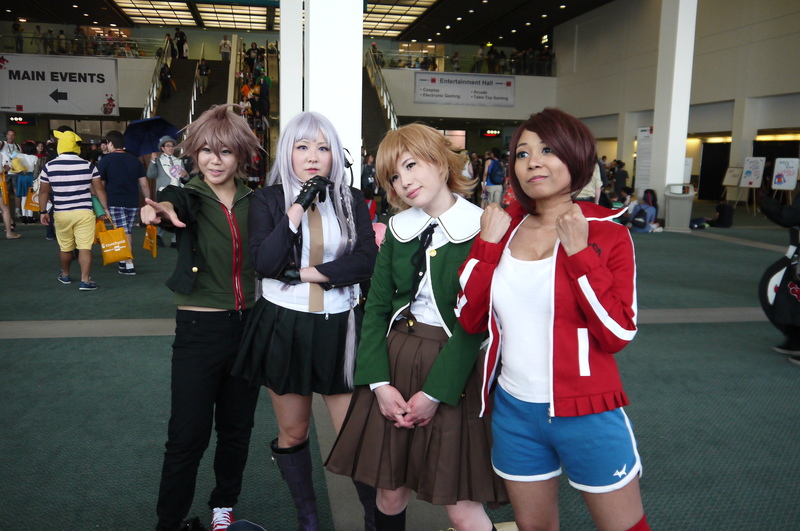 Dangan Ronpa! 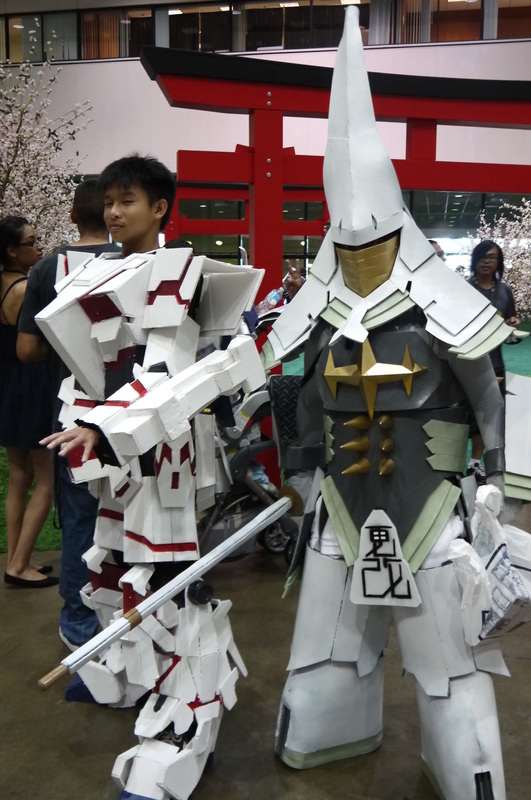 These guys were awesome, just need a little Monokuma following them around now. Another look at the Entertainment Hall, calling it quits from here for now. Thankfully, escalators exist and my comrade is able to ride them in his block wood shoes. 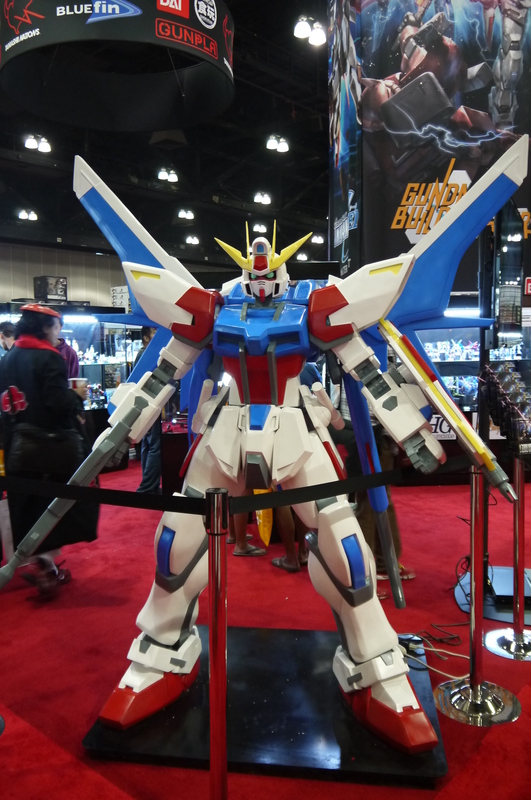 Headed into the Exhibit Hall, first thing we’re greeted with is a 1/10 statue of the Build Strike Gundam. My comrade and I were counting on the same 1/10 Unicorn that’s been here the past two years, but I guess the times are changin’. It looks like Bandai and Bluefin are pushing Build Fighters hard this time around – I thought Unicorn Episode 7 would be the big thing, but it looks like Build Fighters stole the spotlight. There was even a TV right outside the booth playing it. Numerous built Gunpla on display, including up-and-coming kits and entries from the Gunpla Builders World Cup. 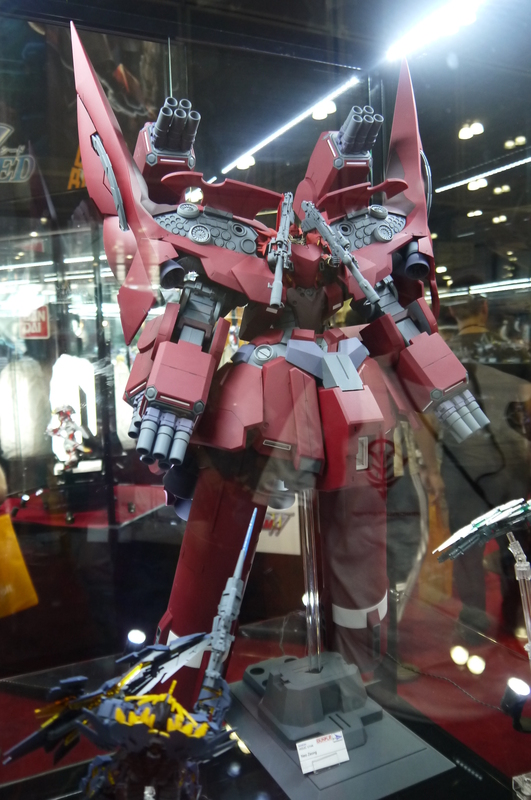 The infamous HGUC Neo Zeong was also on display…holy balls this thing’s size blew me away. I had seen plenty of pictures of it online, but meeting it in person is a surreal experience. I can’t imagine anyone having the space to display this behemoth. .Some other cool stuff displayed at the Bluefin booth. There was a rather impressive collection of Battleship Yamato model kits on display that I know my cameraman took a liking to. The Bluefin booth was also selling quite a few exclusive kits too, all of which were just metallic or clear versions of the original kits. They were priced pretty well though, just not my cup of tea. Had to cut our fun in the Exhibit Hall a bit early today, since we didn’t even get in there until like 3PM and it closes at 6. Given that, none of us bought anything, but we’re most likely going to save our cash for Day 4; sales ’till the cows come home, hopefully. Messing around while de-armoring my buddy after the Exhibit Hall had closed. 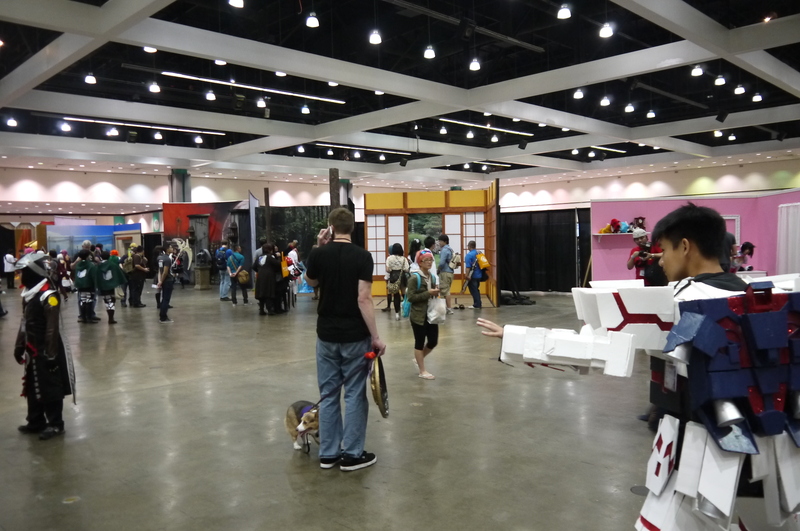 After that, we called it quits and started on the way home; can’t stay for the 18+ panels anyway. Yup, not a super eventful day (literally) as we didn’t attend any panels or anything, but it was still very worthwhile fun. Admittedly a good chunk of the day was just waiting in line though. The crew for the day; too bad my comrade had already de-armored, but two of us are still in costume. 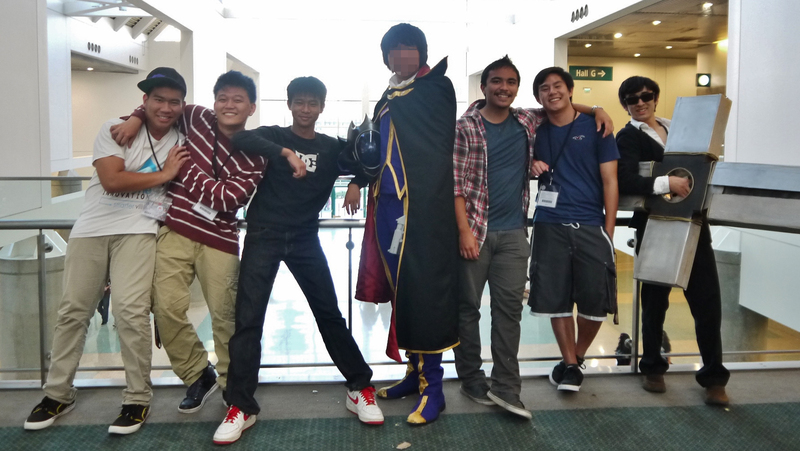 Day 1 was a success, come at us Anime Expo.